THAT’S WHAT EVERYONE CALLS HIM. It doesn’t seem improper, we just do it. Merce’s work, Merce’s studio, Merce’s dancers, Merce’s performances. Christened Mercier Philip Cunningham, known as Merce. Because the name so suits him, suggesting, as it does, both the element mercury—quicksilver, changeable, unpredictable—and the god Mercury, fleet-footed messenger from Olympus. Second, fans (and isn’t that what we are, at heart?) often call their favorites by their given names: Rudy, Martha, Misha, Twyla … Merce. But that is not all. Merce is called Merce because his manner is unaffected and direct; because he is held in great affection, as well as esteem; and because he is so clearly our contemporary—if we can catch up with him. This man who has kept dance apace with the other arts of the twentieth century—music, painting and sculpture, literature—is now busy whisking it into the twenty-first. His work is not merely reflective, it is predictive. He is the least dated person imaginable, and the most acute observer of natural phenomena. Here are a few things about Merce that you won’t find out from his dances: He has a beautiful speaking voice, melodious and low, and the most marvelous laugh. He likes good red wine. He has a black leather jacket. His mother, a woman of considerable independence, loved to travel. His father was a lawyer. He is a Chevalier de la Légion D’Honneur, appointed by president François Mitterand. He doesn’t like to celebrate his birthday. Here are some things you will find out: There is no greater choreographer, no braver or more truthful performer. There is no one more innovative. His dances encompass a technique and a philosophy yet are full of the everyday. Here are the best things about Merce’s dances: They are commanding and rigorous, and submit themselves readily to explication and analysis. Recollected in tranquillity, they absorb all thought, all conjecture—a strange and wonderful power common to all profound works of imagination. They offer a proposition about the function of dance, and a suggestion for how to go about looking at it. One might even come to think, after a long time of looking and thinking, that these dances offer a proposition about the nature of life, and how to go through it. Yet none of this matters at the moment of seeing the dance. In the theater, all you have to do is open your eyes and your mind, and let the dance in. Everything you need to know is in it. There is no secret. You can enjoy figuring out the dance—there is much fun and reward in this—or, when the time is ripe, you can let the dance transfigure you. How this happens is a mystery not easily expressed in words, for dance comes in at the eye. One can say this much, at least. It is not something that happens with every dance of Merce’s, or at every performance, and yet there is this possibility, this necessity: You will find yourself in the dance. 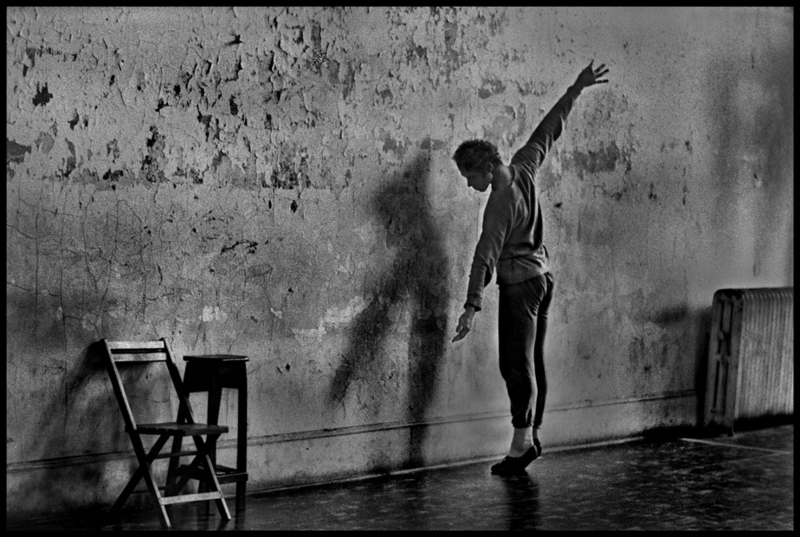 Some years ago, the Merce Cunningham Dance Company performed a season of eleven Events at New York City’s Joyce Theater. (These ninety-minute works, unique at each performance, are paradigmatic Cunningham—made up of fragments, short and long, from the repertory; indifferent as to accompaniment, decor, and costuming; dance for its own sake.) At that time, John Cage, Takehisa Kosugi, and David Tudor were in the pit. (Their music is a whole story—a separate story—unto itself.) One night, Cage waxed oracular, sending forth garbled messages that directly addressed the very issue at hand, as it were. That is, how to partake of the dance before us. Where are we in it? We are with Merce. There is no better company, and there’s no need to worry about where we are going. As Merce says, “The only way to do it is to do it.” We learn by going where we have to go. Dance Ink Monograph I, 1994, published by Patsy Tarr. In the buginning is the woid, in the muddle is the sound-dance, and therinofter you’re in the unbewised again…. “Sounddance” is Merce Cunningham’s iconic work, and now, this week, it will be performed for the last time in a theater where it has been at home before, in the nation’s capital. Here, once again, before our ears and in our ears, three arts—conceived separately and only converging in the theater–will combine, as if they were made for one another. The first is of course the dance; the second the decor (costumes and scenery) the third, the music. There is not, has not been, and won’t ever be another Cunningham dance with a greater unity of impression than this one, the elements joining in a felicitous and exponential explosion. You don’t have to look far into this occasion to see that this last performance of this dance is ripe with metaphor. Next week, the company returns to New York, for performances at The Brooklyn Academy of Music. Then it’s on to Paris. On Christmas Eve, the company will fly home to give its final performances–three last days at the Park Avenue Armory. But in Washington, the very last month in the life of a company that began in 1953 starts with the piece that sums it all up. Everything is in this dance. It always was. And still, it expands to absorb current situation, current meaning, current thought. The very first performances of Merce Cunningham’s “Split Sides” were at the Brooklyn Academy of Music, where it returned during the Merce Cunningham Dance Company’s Legacy Tour, each night occasioning a series of dice tosses to select among the many possible combinations of set, costumes, music, lights, and choreography. Here is a diary of those first four evenings, and what they revealed. Rolling the dice gives a moment of wonder, the imagination conjuring. A split-second later, the dice at rest, the mind becomes active. 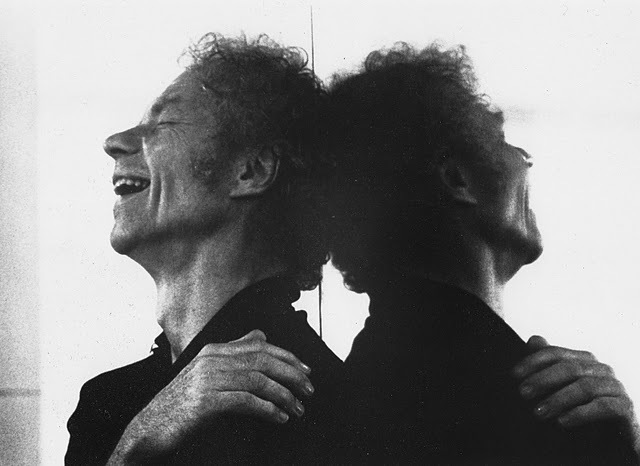 OF ALL of the multiple innovations in the work of Merce Cunningham, the use of chance is the most confusing. Such a clear thing, this toss of a die, or a handful of pennies, and yet chance is the part of the Cunningham dogma taken on faith, and dimly apprehended. The independence of dance as an art form–the notion that dance does not need music, but may simply coexist with it—still may seem heresy to some, but as an idea it is well understood. The separation of dance from story is now old hat, or old enough, though still giving rise to the notion that Cunningham’s dances are “abstract,” when dance, because it is done by people, can never really be abstract. BUT CHANCE! Chance makes people think of randomness, of disorder, of improvisation, of fate and fortune, of things made up as they are happening, or just before. Nothing, though, could be further from the Merceian truth, which is quite the opposite. His is not the unhinged Miltonic world of Paradise Lost, where “Chaos umpire sits,” and “Chance governs all.” Not in the slightest. In his world, Merce governs all, even when by a kind of non-doing, this latter being neither benign nor malign, but a kind of sovereign absenting of ego. Even when Cunningham does not make choices—as when, for instance, he leaves the decor to the art director, or some similar personage, who chooses the artists; and likewise hands off the music—he has chosen the chooser. The truth is that in his world, Cunningham is God, or, in terms of the Tao, the center of the wheel from which all spokes extend. Every choice, or non-choice, is made by him. 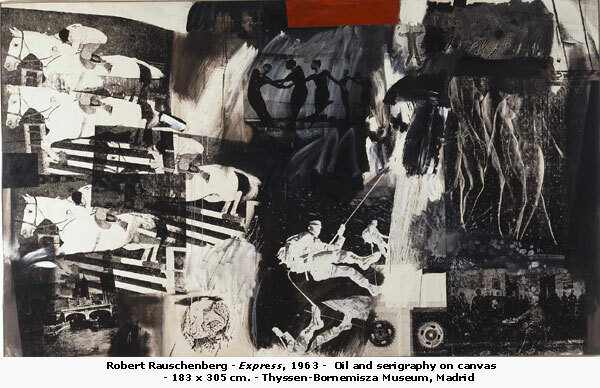 You can see the images as an assemblage of unlike elements co-existing, and you can see the dancers among them representing beauty–and grace itself. Tilting at gravity, they embody the ability to fly through the air under one’s own power. Or, you can see the dancers apart–find them to be a beautiful refuge, as art can be, from the world and its various clamors. They draw your eye, and into the canvas you fall, and all the rest is left behind. Outside. You’re in here. Inside the painting, or inside the dance.